If temperatures reach 30 ºC in the south east of England today (15 Sept 2016) it will be the first consecutive 3-day September period where temperatures reached over 30 ºC since 1929. However this is the last of the hot days as after today temperatures will be returning to what we would normally expect for this time of year. The humid air currently in place over much of the UK is likely to lead to isolated, slow moving, severe thunderstorms later today, most likely over central southern England as daytime temperatures reach their peak. Into the evening and overnight a weather front moving in from the Atlantic will merge with the warm, unstable air over the country, resulting in a much larger area of heavy, locally thundery rain to develop over the eastern half of the UK. This will slowly clear eastwards during Friday. 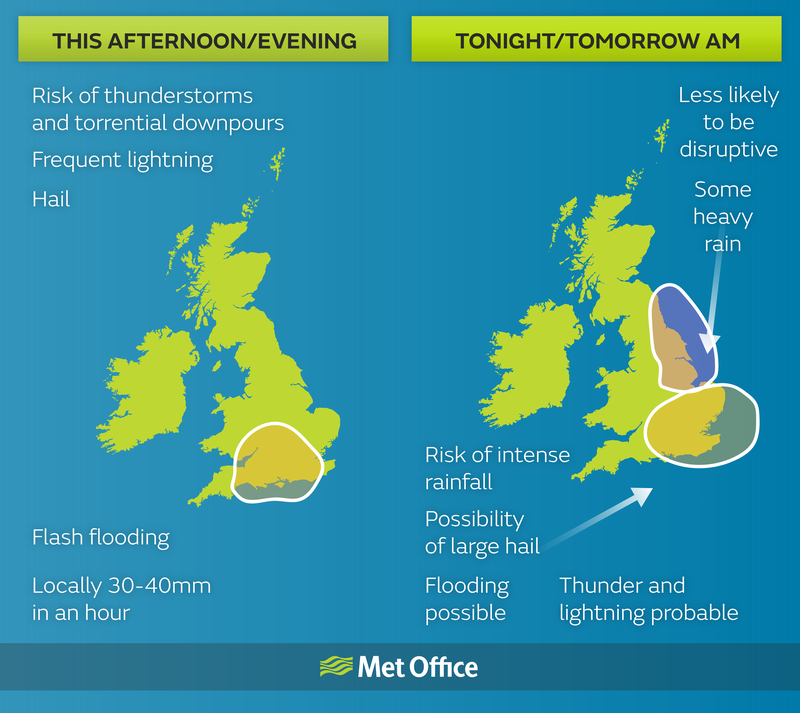 Yellow severe weather warnings for rain are in force for both this afternoon and evening, and again for tomorrow. Some areas could see 30 to 40mm of rain in an hour and even, by Friday, up to 50mm in places, although the public should be aware that the vast majority of places will have less than this. If the heavier rain falls in built up areas or on main roads it has the potential to cause disruption to transport and possibly to power. The last week has seen some very warm weather. Temperatures on Tuesday peaked at 34.4 ºC in Gravesend in Kent, which was the hottest day of the year so far, as well as the hottest September day since 1911. The day ended with severe thunderstorms in the Manchester area which disrupted traffic, delayed flights, led to some flooding and the Manchester City football game being cancelled. As the warm weather moves gradually away into the Continent temperatures are returning to what is more typical for this time of year. Eastern areas may remain cloudy over the weekend with outbreaks of mainly light rain as the remains of Friday’s weather front lingers, but further west drier and sunnier weather will dominate. However, the influence of the Atlantic is likely to steadily increase, with the weather becoming more changeable overall into next week. The northwest is likely to see the worst of any wet and windy weather while the southeast is generally expected to be drier and brighter. Bands of rain are likely to move into the UK at times, interspersed with brighter drier spells, and showers. You can keep up to date with the weather using our forecast pages and by following us on Twitter and Facebook, as well as using new mobile app which is available for iPhone from the App store and for Android from the Google Play store. This entry was posted in Met Office News and tagged England, flood, flooding, forecast, heatwave, heavy rain, Lightning, lightning strikes, Met Office, National Severe Weather Warning Service, rain, rainfall, record, severe weather, Storm, storms, temperature, UK, weather, weather forecast, weather forecasting, wet, wind. Bookmark the permalink. Well done, this was a most accurate forecast. Local rainfall produced nigh on 70mm totals during several violent episodes. Lots of thunderstorms with many a CG strike within them gave medium to large size hailstones in some parts and as a result, much flooding occurred. Again, I applaud your forecasters and their analyses.